Have You Ever Seen A Snowman Swim? 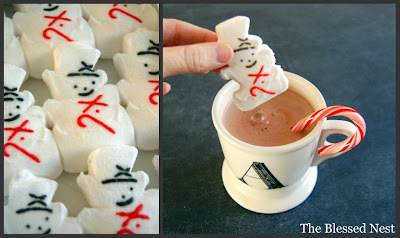 This is such a fun wintry treat for the whole family! My kids were beyond thrilled when they first enjoyed these as a surprise! 1) Ask your kids if they've ever "Seen A Snowman Swim?" 4) Pass out to the family & say "Well, now you have!" 5) Stir with a candy cane and enjoy this fun moment together!!! According to my girls, anything pink, bright, colorful & glittery is IT when it comes to decorating their room for Christmas! I let them have a little tree in their shared bedroom this year, and we kept the decorations simple & sweet. Snowman ornaments, colored lights, a home-made paper chain (which I thought should be a bit longer, but there's always next year...) & a big glittery pink star! The "tree skirt"? It's a pink & white gingham crib sheet from when they were babies! We used only what we had, and the girls had a ball decorating their tree! We placed the tree by the little rocking chair that used to be mine when I was a little girl. Such a fun tree for little girls! And the best part was decorating it together using what we already had! My daughters each chose something that they'd like to collect for Christmas while growing up. This way they'll have a nice collection of decorations when they get their own first place someday! My kitchen is getting a mini transformation today! 2) raise our current cabinets, add moldings, and paint them out. I can't wait to show y'all pictures & my paint & fabric swatches!!! So for today, why don't you do a mini-transformation of your own? Mmmm, Visions of Sugarplums must have been dancing through my head when I came up with this "Sweet Shoppe" theme for decorating my kitchen this Christmas! What kid, or grown-up for that matter :), can resist a candy shoppe? Especially if it's at Christmastime!!! Now, don't you go focusin' on that plastic taped above my cabinets just now! Instead, look at all of the fun goodies in my little vignette above the fridge. Mixing antiques, collectibles, a super cute chalkboard, and handmade "candy" ornaments from my kids is what makes this special! Can't you just picture Mrs. Claus and the kitchen elves buzzing around their Christmas kitchen? Flour dusting their aprons and noses...the smells of gingerbread, sugar, & cinnamon filling the air...icing and sprinkles...laughing and singing Christmas carols as they fill orders for yummy baked goods, ready by December 24!!! Gumballs and old-fashioned lollies fill apothecary jars! A candy-cane looking ribbon gives a finishing touch! Handmade ornaments from my children fit the theme here and fill collectible baskets. I just love handmade touches, don't you? I collect Longaberger baskets, and also Mark Roberts Santa fairies. They look right at home here in my kitchen this year! How fun to imagine the little elfish fairies baking goodies in the kitchen! Mmm...this one is drinking Hot Cocoa, my favorite this time of year! Glass ornaments and cookie cutters fill my little kitchen tree! What a sweet surprise from my Sweet Girl! I'll be leaving this up all season long!! Milk glass looks lovely holding some Candy Cane Sweets! 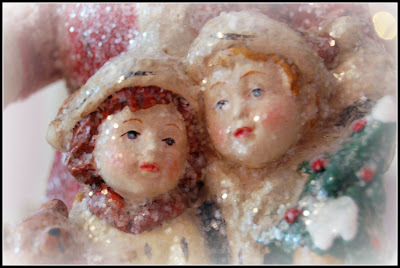 This is just some of the festive touches in the "Sweet Shoppe" kitchen, I'll share more another time! Thanks for visiting The Blessed Nest today, I really am grateful! Leave me a little "hello!" in the comments section -- I just love getting comments and hearing from my dear friends, both old and new!! Are you getting any snow today? Here in the Chicago area we're supposed to be getting several inches! The girls were very excited, till it came time to bundle up before leaving the house for school. Then our living room turned into a 3-ring circus! Someone stepped in a wet puddle left over from yesterday's melted snow by their boots and had to change socks. Then another child came to me looking like the Stay-Puft Marshmallow Man, complaining that she couldn't snap the hard snaps on her coat nor could she put on her hat with her fat gloves on. After getting on dry socks from the "puddle in the house" incident, my youngest was crying because her pinky finger wouldn't fit inside her new gloves. Sure enough, it was sewn wrong inside & I've got to order another pair! My little Southerners had better get used to winter again in the Midwest! After dropping the girls off at school this morning, I drove around snapping a few wintry pictures! The first picture is from the Christmas decorations in my girls' bedroom. It totally reminds me of them! One with reddish hair, and one with blonde! I love this! It looks so vingage-y and cute!! Welcome! I'd love to show you my living room tree, one of 4 in my home here at The Blessed Nest! I am totally in love with the look of this tree! I've decorated our more "formal" tree in the living room this way for the past 3 years. The inspiration for this tree came from my love of birds (of course!) and from all of the real pheasant feathers I've collected from my shooting trips with my Dad over the past few years. This tree is filled with warm reds, champagne-y golds, and rich browns and ambers. Wired ribbon cascades down the tree, and pinecones, pheasant feathers, glittered leaves and berries, and little glittered birds peek from the branches. I love birds! Watching them, preparing homes in my yard for them to build nests and lay their little colorful eggs, learning about the different species, I love it all! What beautiful creatures! Since I decorate with birds & nests throughout the year, it was only natural to have a few on my Christmas tree! Our Christmas tree in this room is directly centered across from a large bay window on the front of the house. I love to leave the curtains open in the evening so that neighbors driving by can see the pretty tree lights inside, looking all Christmas-cozy! I added matching leftover ribbon to my lamps on the entry table too. I can't wait to show you all the rest of our little cozy home all dressed up for Christmas! My favorite spot has to be our little kitchen, with a "Mrs. Claus's Sweet Shoppe" theme! My girls just LOVE that, let me tell you!! LOL! This Christmas season I decided to decorate using things I already had. Which, since we're living in a new house now, meant that I had to get creative and use old things in new ways! Looks all "fancy" now, doesn't it? I honestly can't believe how simple this was to do! It only took about 15 minutes to make! I knew I had to share this with you!!! Well, this garland used to be a plain ol' thing that draped along our staircase banister. Cute, but a bit "blah". ....up on top of the bookshelves it went! Step 1: Find a great place for your garland! Now you're ready to get started "fluffing" your garland! Time to make our super easy bow! This is easiest if you have a long length of ribbon. Starting near the middle of the ribbon start to loop it around several times. Kind of like when you wind up a garden hose, or if you were a cowboy gathering up your rope! Do it several times until you'll have 3 "loops" for each side of your finished bow. You should have 2 "tails", one on each side of your bow. Try to work your "loop" so that the "tails" are similar length. But don't stress too much about it, it's gonna get tucked around anyway! Next, take a short piece of the same ribbon and wrap it around the center of your "loops", tying in a little knot in the back side of the "loops". This will make your bow look like it is tied. Be sure to leave the ends of this knot a little long, don't clip them! Go ahead and fluff out your bow! Step 4: Attach the bow to the garland. Take the ends of your bows' knot and use them to attach the bow to your garland. Just knot it around the garland, then fluff the greenery around your knot a bit. No one will see! Next, gently wind the ribbon "tails" about the greenery, play with it till it looks good to your eye. I added little fake ribbon loops by just making one little loop and using scotch tape to secure it. That's what I had on hand! A little florist's wire or even a garbage bag tie would work too! Step 5: Attach ornaments to the garland. Gather some small leftover ball ornaments together into groups of 3. Using your floral wire or a green pipe cleaner, string a group of ornaments on, then twist the wire together by the ornaments to secure them on. Add the ornaments to the garland by twisting the wire securely around several branches of greenery. I added ornament groupings by my bow, near my "loops" of ribbon, and toward the end of my garland. Step 5: Add in the pretty fillers! I used pheasant feathers and pinecones to "fill in" my garland in a few spots and make it extra fluffy-full and pretty! Use what you like. Maybe something that coordinates with your tree! Feel free to adjust things around until you're satisfied with the look of your garland! Plug in the lights and enjoy it! Now you know how to get an expensive, designer-store looking garland on a Use-What-You-Have budget! How are you using what you have this year?